where cherished family heirlooms are brought back to life. This is the workshop of dreams. Home to furniture restorer, Jay Blades. that once it's broken, they just bin it. will be some of the country's leading craftspeople. It's amazing to think some of my work becomes a part of that story. and irreplaceable pieces of family history. -This is what I remember. In the Repair Shop today, Steve is stumped by a precious wartime clock. I'm just too nervous that it's going to actually end in tears. And Dom comes unstuck with some heavy metal. I've come so far, we're so close now to getting it completely apart. I can't leave it. I've got to try and get it off. actress Anne Marriott has brought a fragile reminder of her late husband. -All right? I'll take that for you. 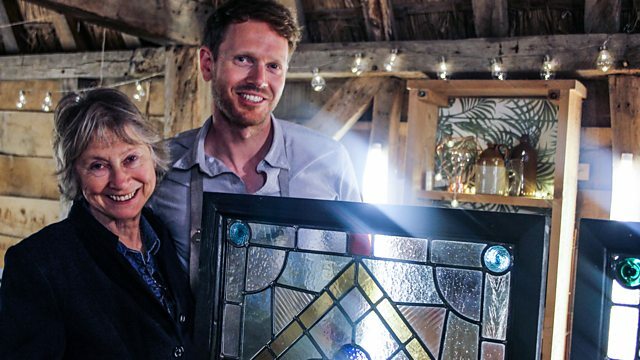 The man for this job is resident stained-glass craftsman Matt Nickels. Let's have a look at this, then. What are we opening here? when it was being sort of finally demolished. in-between the auditorium and, say, the bar at the back. -To indicate to people where their seats were. -Oh, that goes in there. -The posh seats, I guess. and was a much-loved variety venue until it closed 60 years later. It lay derelict before it was finally demolished. fishing them out and realising the treasures they are. Must have fallen in love with them, really. they spent years wrapped in newspaper and up in an attic. What do you reckon, can you do something with these? I can, I can indeed. It's nice when you look at this one that there's no broken glass. so you can see all of the lead has been cut at the joints there. I think this one is going to be the easiest one. and restore them back to their former glory. That will be absolutely wonderful. in these sorts of buildings, actually. -Now, that's a nice story, isn't it? -That's a really nice story. It's kind of taken from the theatre. -Her husband was in the theatre. -And now the theatre is going to be in her house. -And make them look good, yeah? -Yeah, I am indeed, yeah. What I need to do is take them over to your bench. and some of them have extraordinary stories to tell. that is steeped in history. They are hoping that horologist Steve can lend his expertise. Here we are. Right, what have we got? I think there's a little bit of woodwork that needs doing on this, as well. Will? Have a look at this. which he crash-landed after being shot down in the First World War. he volunteered immediately for the Flying Corps. crash-landing an aircraft in those days. No. I mean, he was quite badly injured, apparently. And did he talk much of the days of flying? Now, tell me about the clock. What's wrong with it? Well, we're going to make it into a working clock again. And we'll fix the base so that it's tight and will work well again. -Yeah, that'll be great, yeah. A great bit of history behind that. -I know. It's a pretty cool clock, isn't it? -..then all of the generations wouldn't be here. It's such an important piece to them. To know what that's been through, it's quite nice if we manage to salvage that. from the clock and replace it with a quartz one. produces a regular electric pulse that keeps the time. I'm just going to pop the movement out now. I just need to snip the wire off. That's the easy bit. And this should just push out. It's completely bunged up and, er...I think that's quite dangerous. and putting a quartz movement in it. I'm actually thinking now that the dial is plastic. I can give the case to Will. two treasured windows rescued from a demolished Victorian theatre. So we've got the drawing here. I'm just taking the outside lead off and just teasing this out. it's very important to make sure that they go on immediately. You don't want to mix anything up at all. the angles might be slightly different. The difficulty will come in building a replica of the original window. -What are you up to now? -It looks like you're wrecking a piece of glass. Well, these are the original pieces that came in. One of them was fully intact. that there was just the central section and none of the outer part to it. so this is all original Victorian glass. for the tints for this piece. Do you have loads and loads of bits of old glass like this? but, you know, at some point, yeah, you might use them. -So all of that's missing? -All of that is missing, yeah. -So I've set myself quite a big job. are reminders not just of family history, but of working life. -If you follow me in. Dom, I've got one for you, mate. that's been in her family for over 100 years. All right. So I've gathered it's heavy and it's metal. Yes, and it's very rusty. It sounds perfect for me, this. So, please tell me, what is this? -you can stretch the shoes and then you can wear them. -Push these in and out. -It is a clever thing. It's very clever. It was my father's and his father's before him. They had a shoe-repairing shop. So, where was this shop, then? It was in a place called Southall in Middlesex. OK. And why do you want to get this restored, then? Why do you want it done up now? It's such a reminder of my childhood. and I used to do all the change and the money and what for people. of my father's whole lifestyle. -We'll look after it, exactly. So, Dom, what do you reckon? -That's a very kind way of putting it. with the paint, things like that. Do you want to preserve some of the history of this old, flaky paint? -because it would just be as it was. -Just as I remember it for all those years. and as soon as he's done it and got it looking red again, we'll get back to you. and could really test his mettle. This is not strawberry smoothie in here. It's a bit of an old sort of farmer's trick from back in the day. working it into all the little areas. There's lots of small bolts and bits we need to free up. come back in the morning and see what the results are. embedded in an aircraft propeller. the job of reviving the mahogany case. that I've made up to clean off waxy surfaces and dirty surfaces. Look at that. Decades of dirt on there. You can see already it's a lot clearer. You can actually see the lettering a lot better. which is what you use for French-polishing furniture. Steve has a rather grimy dial on his hands. He's hoping Kirsten might be able to help get it sparkling again. Right, a bit of advice. and it's just stained that. but I can't because I'm concerned that I'll take the numerals off. Yeah. Have you tried anything on it yet? -just to try and remove some of this grease? -I don't think it's made any difference at all. but I don't know what'll happen to the rest of the plastic. The trouble is, it's quite difficult to control it, really, isn't it? Do you know what, I think, actually, we're going to leave it. -I'm just too nervous that it's going to actually end in tears. of the stained-glass theatre panels. for the smaller panel completely from scratch. pieces of glass that don't have any housing on them yet. So here, you've got your lead knife to cut your lead, like this. Then you're going to use a horseshoe nail. the entire piece can be secured with solder. The shoe stretcher's had its bath overnight in the pink solution. That's penetrated in as much as it can. because it's still...impossible to turn. it will expand ever so slightly. A tiny, tiny amount. Just expand a little bit to try and break that rust joint. This dial here will turn that, so that should start moving. I've heated up in there. I'm just going to give it a little tap. I don't really want to be hitting it with a hammer too much. It's obviously as fragile as anything. Sometimes the shock of hitting it just frees up. Just starting to move now. A little bit of oil. I'm really pleased. It just shows that red potion did its job. but it's well on the way now. Good place to get the rest of it freed up, as well. on the propeller clock a gentle polish. Now he's got to get it ticking again. so this is just a simple quartz movement. So all I need to do now is to make these hands fit onto the movement. I need to modify that so that it fits the new movement. so it just fits onto the movement friction tight. It's almost there, not quite. and then it will be ready to go into the clock case. the imperfections in the 100-year-old mahogany propeller. That's brought that right out. So, I think you can see here, there's a chip on the base. so I can use some pigments in that layer of polish to disguise that fill. -OK. Cool. You're doing good, mate. until the damage is completely camouflaged. are bonded together for years to come. So this is the part I really enjoy. and also makes the window very rigid and strong. A big dollop around the edge. It does feel a bit naughty, when you put all these on. kind of like cake mix on top of it. I wouldn't eat this cake mix, though. it goes underneath the lead. And then just do it until you're back at the beginning again. Just got to wait a little bit and that's going to set. so that he can clean every individual component. But there's one stubborn bolt holding up the whole operation. I've come so far, we are so close to just getting it completely apart. I can't...I can't leave it. I've got to try and get it off. It seems like it's moving. The pieces are finally ready for a long overdue deep clean. so I'm just going to polish the surface and leave some of that. some of the character in there. Now Dom must paint all the pieces just as Maggie remembers them. another important piece of family history. reminder of his late grandfather's service and bravery. You, too. Excited to be here. Yeah, I'm sure you are. I'll get your clock. -And it's saying about the right time as well. -It is. That was lucky! So I've taken the old mechanism out. -I've exchanged it for a battery quartz mechanism. -So it's a lot safer now. -The old mechanism was really quite dangerous. -The dial is actually a plastic dial. -Is it? Oh, right, I didn't realise that. -Apart from just clean it the way we have. And Will has polished the case up beautifully. Yeah, it looks amazing. My dad will be very, very pleased. Thank you very much for bringing it in. That was a real joy to work on. -Thank you for all your work on it. It looks amazing. Dom is now painstakingly piecing them back together. all the moving parts are just dry. So as I assemble it, I'm just going to just keep greasing up the parts. Definitely looks different. I'm a bit anxious to see her reaction, actually. had been rusting away in her garden shed for over 30 years. She's ready to be united with this treasured slice of family history. -OK. Shall we let her see it? Oh, wow! I can't believe it! -And it's red, as well. Look at that! It's shiny! I can't believe it! How did you manage that? -It was a lot of work. and all the markings, absolutely brilliant! Where you've cleaned this all up, you can see the marks around here. -It's amazing. Very well done. Did it take you hours and hours? Getting it apart was tricky, yeah. Yeah, it was a lot of work. So, when was the last time you saw this working, then? Well, I must have been somewhere about 15, I would think. -And I'm not going to say how long ago that was. -But it was a very, very long time. -A couple of weeks ago, yeah? Now, I have brought with me a pair of shoes. Now you need to pull that back to make the shoe tight on. -Keep going. Yeah, keep going. That's it. -Can you see how that's coming open? But I wouldn't do it more than that now. gradually stretch the leather out. Looking at this now, it's just fantastic. And it brings back so many memories. I can almost see it sitting there beside my father as he was working. I'll be happier when I can wear the shoes. -When you can wear the shoes! They'll bring their shoes. You'll be working again. -I shall have lots of tea parties. Fantastic! I can't believe you've made it look like that. never mind get it to work and look so fantastic. that Matt's been restoring are nearly done. But he needs Will to help him get them over the line. -What do you think of these, then? Looking a bit messy, isn't it? have been hanging out on your stained glass. Well, this is pretty much the final bit. This is the cement. When I've cleaned it, it's going to be nice, crisp lines. but we said we were going to do a frame. You look like you've got a lot to do. -I will help you out and get onto those frames. that are such a powerful reminder of her late husband. -Do you want to come around here with me? And the colours are just wonderful. I can't believe how much light is coming through, actually. It sparkles. It really, really does. And then the other one you brought in was just the central piece. -And it was in a bit more of a sorry state. -I'll show you what I've done with that one. Because you only had...you only had the central bit to work with. So you've recreated all of that, haven't you, around...? to have this kind of restored...? Oh, he'd be...he'd be over the moon. I can't thank you enough. I can't thank you enough. I've got two beautiful pieces. They're full of life again. They'll bring good old Sean back, but in a very happy way, actually. I can't quite believe it, honestly. It's lovely. are rescued and restored in The Repair Shop.